Schoenfelder Mennonite Church (Pigeon Lake, Manitoba). 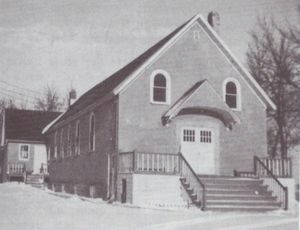 The Schoenfelder Mennonite Church in St. Francis Xavier, Manitoba held its first worship service in 1925. At that time recent Mennonite immigrants from the Soviet Union had settled in a district just west of Winnipeg and little groups could be identified in Pigeon Lake, Headingly, Elie, Meadows, Marquette, High Bluff and Westbourne. Four men that had been ordained as ministers in Russia served these groups – Jacob J. Braun (who moved to Ontario in 1928), Johan Wall, Johann A. Driedger, and Gerhard Doerksen. In 1927, 11 families settled along the main highway running through St. Francis Xavier to Portage la Prairie. Minister Johann Driedger, who was part of this settlement, drew together a larger circle of groups in 1928, which joined the Schoenwieser Mennonite Church group as Salem-Friedens Kirche (Salem Peace Church). On 25 January 1939 the congregation voted to become independent and chose the name Schoenfelder Mennonite Church. This date marked its formal organization. David Abrahams, a teacher from Schoenfeld, Russia who had been ordained in 1931 as a minister, became the founding Aeltester in 1939. The church continued to have lay ministers. Henry Becker was another minister that was ordained in 1931. He was known for his interest and involvement in theological issues, evidenced by his attendance at conference sessions and Canadian Mennonite Bible College annual lectures. The first building was purchased in Rosser, Manitoba and moved to St. Francis Xavier (a few kilometers southeast of Pigeon Lake) in 1929. Subsequent building programs in occurred in 1940, 1953 and 1985. A cemetery was established at the church and the first burial occurred in 1930. The language of worship was initially German, transitioned to English during the 1960s, and continued to use some German for a number of year. In 2010 the congregation made a decision to withdraw its membership from both Mennonite Church Manitoba and Mennonite Church Canada, with which it had been affiliated since 1939. The stated reasons were that "they didn’t have much to do with the conference anymore" and "the conference agenda seemed to be drifting away from God’s word." Canadian Mennonite (16 September 1955): 5. Mennonite Reporter (15 September 1986): 14. Friesen, John. "Die Entstehung der Schoenfelder Mennoniten Gemeinde zu Pigeon Lake." Research paper, Canadian Mennonite Bible College, 1952, 7 pp. Mennonite Heritage Centre. Siemens, Jacob. Chronik der Schoenfelder Gemeinde von 1925 bis 1968. Pigeon Lake, MB: Schoenfelder Gemeinde, 1968, 28 pp. Our First Hundred Years: A History of St. Francois-Xavier Municipality. St. Francois-Xavier, MB: St. Francois-Xavier Municipality Historical Committee, 1980: 92-95. Records microfilmed at Mennonite Heritage Centre. Abrahams, David and Alf Redekopp. "Schoenfelder Mennonite Church (St. Francis Xavier, Manitoba, Canada)." Global Anabaptist Mennonite Encyclopedia Online. November 2015. Web. 23 Apr 2019. http://gameo.org/index.php?title=Schoenfelder_Mennonite_Church_(St._Francis_Xavier,_Manitoba,_Canada)&oldid=142545. Abrahams, David and Alf Redekopp. (November 2015). Schoenfelder Mennonite Church (St. Francis Xavier, Manitoba, Canada). Global Anabaptist Mennonite Encyclopedia Online. Retrieved 23 April 2019, from http://gameo.org/index.php?title=Schoenfelder_Mennonite_Church_(St._Francis_Xavier,_Manitoba,_Canada)&oldid=142545.